Wish I could manage some lovely words to go along with the layouts of Loulouthi quilting cottons today, but am about to hop in the shower and then head to the second day of Quilt Market here in Salt Lake. Wish you were here, hope to share more later so that you can feel like you are! Who needs lovely words when showing so much loveliness! Its all gorgeous! Aww you named the palettes after your girls! What a sweet mama. I've been stalking the internet (mainly twitter) for photos of your booth at market! But you totally made my day with this post! Thanks for including us! 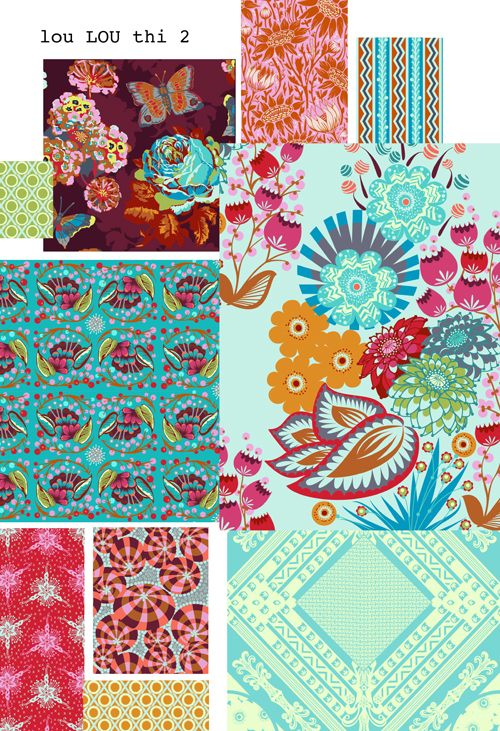 Oh and I'm dying to get my hands on every last fabric in this line! Gah! Oh...btw...saw some beautiful garments made with some very familiar fabric on Leila & Grey website! It's so beautiful! Can't wait to see it at my fabric store. So gorgeous. Love the Eleni colorway. Enjoy yourself today! While it's always nice to read your words... I have to say: these prints say everything! What beautiful art you make. It was wonderful to meet you! You as beautiful and lovely in person as you are online. hope you are having a fun time! i love the new line and can't wait to buy some! Truly breathtaking, and I love that you named the palettes after your daughters. Thanks for letting us see all this lushiness! Love the palettes, love their names even more!!! These are just gorgeous! Thank you for sharing them--enjoy Market! woow!! I loved all the prints and their names!! I wish I am there to visit the quilt market. Gorgeous! I can't decide which is my favorite colorway - they are all lovely! oh, the other two pallates are fun, but I love the Eleni pallete. I wonder if its because I'm a fifth child too? Can't wait to see some of these fabrics "in person". Hope you survive Quilt Market. Oh my goodness...this collection is stunning. I'm a huge fan of your work already, but these new designs are just unbearably beautiful. I cannot wait to get my hands on it and get to work! (A quilt is definitely be the first thing on my to-make list!) Thanks so much for sharing this with us! Oh so pretty!!! Your art is truly amazing! I could see lots of hexies on a dark ground with these. Or maybe something bird-ish. How much fun! Me and the Eleni Palette are very happy! Your BEST yet! I cannot wait to buy these. Beautiful line Anna Maria. lovely! I think the Isabela palette is my fave! Ohh, art is enough today! Just lovely - I can just imagine playing with these lovely fabrics! AMAZING!!! :) This has been what I've been waiting to see - among all the pics up around the blogs of Quilt Market. I wanted to see these pictures! :) Looks like my birthday present... when will they be available? 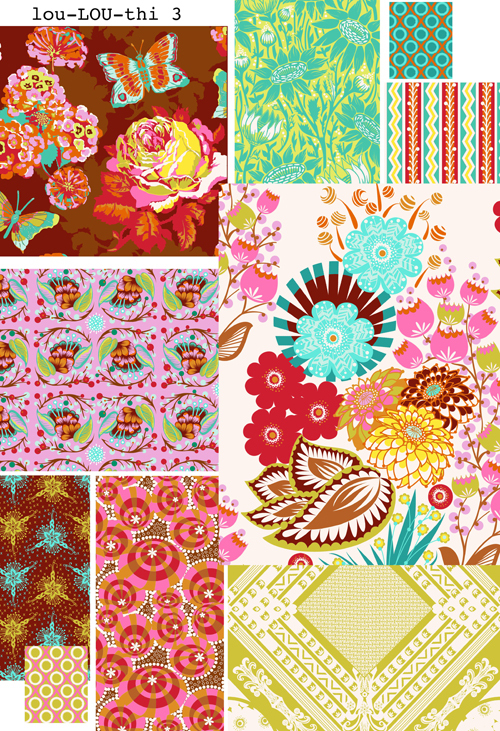 such prettyfabrics! my godness that cheered me up a lot! wow! just wow! Ooo the new line looks great! i love how you have named your pallettes after your daughters. adds a lovely touch! Love them!! Loved meeting up with you at Quilt Market and meeting the beautiful Juliana !!! You , the booth, the fabrics, the projects were all fabulous!! Thanks again for more lovely goodness to help inspire us!! I ordered Loulouthi at market yesterday. I can't wait to get it to my shop. Would it be okay with you if I used your pictures to show how my customers? Beautiful! Can't wait to get some. Love that you used your girls' names. I always wonder, "How can she possibly top herself? How can she make a print more beautiful?" And then....you show me something like this! what a beautiful new collection! I love the color palettes, and the names you gave them, of course. I think Eleni's colors are my favorites, but I will probably try a sampling of all three. I can see pieces from past collections (garden party? and little folks?) in here, which makes this quite fun to incorporate past prints. Can't wait till these become available! yummy fabrics! When do I get to sew with it! OMGosh!!! I cannot wait to get my hands on this!!! I've been harassing the ladies at Westminster for information on preordering these for weeks and STILL no word! Unfortunately not everyone that owns a shop can go to quilt market; it's quite discouraging! (I know this is not your fault, AMH...I'm just venting) Mainly because when I ordered the IC line last October it wasn't delivered until January, and I don't want that to happen again with this line, because it's quite spring-ey and it arriving in the fall won't be such a great thing. Wow! 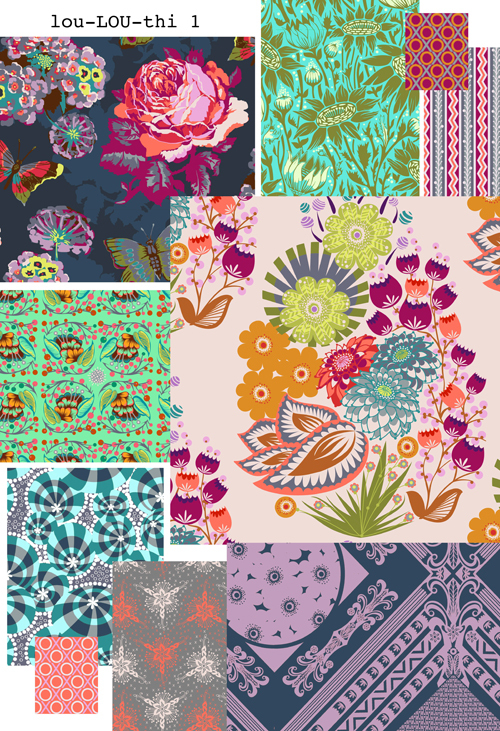 I totally adore these new fabrics. I want a yard of each to wrap myself in!! Can't wait 'til they're out! words are overrated. here's one that i think applies: GORGEOUS!!! Just beautiful. Can't wait to get my hands on these! I LIVE in Salt Lake!!! Wo is me because I can't come to quilt market. Amy Butler was at a boutique shop here and I met her, but do you want to know a secret? I love you way more, and I love your fabrics and style WAY more! Kisses! Just finished a dress for my 2.5 year old daughter made from your fabrics. This is just such an amazing line. I adore the color palettes and the variations in scale. Romantic and modern - and the flowers! WOW!! I am clearing my tables for when this arrives on my doorstep! Thank you for sharing your blessed gift with us!!! Oh my gosh I am soooo coveting those prints! Are you going to do these in voile? Some are screaming SUMMER SCARF to me. *squee* I love Loulouthi! I can't wait to work with the fabric! I will order it when it comes out. You have such a talent with fabric design. If I created a superhero and her super power was creating ridiculously awesome fabric, I would call her Super Anna Maria. Your new line of fabric is so gorgeous! Such a visual feast and I love that you named the individual palettes after your lovely daughters. This is the most beautiful fabric I have ever seen... Anna Maria you are incredible!. I LOVE every single swatch.I can't wait to design a gorgeous collection for little girls..
Mynet Sohbet kelimesinde ugrasıoruz. yenı host aldım. sıra Chat kelimesine gelecek. ondanda bısıler yaptık mı sıra Sohbet Siteleri keywordune gelecek. sagol admin. We just loved what you did above. I couldn't ignore those elements, they are so cute.